The level of blood pressure in women may vary for different reasons. In healthy women, blood pressure can be changed because of physical or nervous overstrain, as well as negative emotions or excessive fluid intake. Moreover, the change in blood pressure can be a sign of cardiovascular disease. For timely diagnosis of cardiovascular pathology, blood pressure should be checked regularly. If besides the blood pressure change, other signs of cardiovascular diseases appear (chest pain, edemas, breathlessness, fatigability), be sure to inform your doctor. In some cases, physicians advise their patients to note down in the chart mealtimes, blood cholesterol level, the time of medications intake, as well as the periods of physical loads, rest and sleep. It should be noted that the level of blood pressure in healthy men and women of the same age might be different. 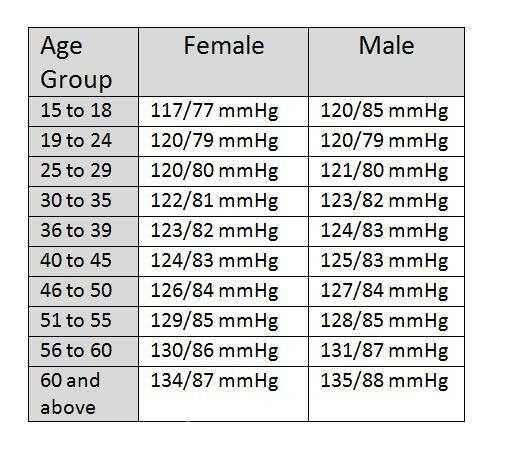 Therefore, blood pressure chart for healthy woman may differ from the chart for healthy man. Blood pressure chart is necessary both for the diagnosis of cardiovascular disease and for the improvement of blood pressure control in patients with hypertension. Making up the chart, a woman can know in what situations her blood pressure changes, what factors contribute to tachycardia, what doses of antihypertensive medications are optimal for each case. Regular making up the chart will help a woman to control the blood pressure without the constant help of doctors. Moreover, the blood pressure chart allows timely to reveal abnormal fluctuations in BP and to replace the type of used antihypertensive drugs* if necessary. For daily blood pressure control and making up the chart, it is required automatic or non-automatic sphygmomanometer. If a woman wants to measure the blood pressure by herself, it is better to refrain from using cheap non-automatic manometers. Compact and convenient automatic manometers are available at the US market, by which a woman can quickly measure the blood pressure as many times as it is necessary. By making up the blood pressure chart, a woman should remember that the doctor needs the information on all aspects of activity throughout the day to decrypt the chart. To the doctor is able to make an accurate diagnosis, besides blood pressure measurement, it is necessary to keep a diary and note down all the actions from the moment of morning awakening. Many factors affect the change in blood pressure chart, such as walking, ride by car or public transport, TV watching, food intake, reading, conversation, medicines intake, climbing stairs, running, intense exercise, rest periods, night awakenings, emotional experiences. In addition to the blood pressure chart and the list of factors that could affect the level of blood pressure, it is necessary to make up a list of all symptoms that occur throughout the day. When appearing chest pain, heart pain and other signs of cardiovascular diseases, be sure to seek a professional medical help. The names of groups of antihypertensive drugs used to control blood pressure: diuretics, ACE inhibitors, Beta-blockers, Alpha-blockers and calcium channel blockers.